Apple on Thursday removed the $99 MobileMe product from its online store and notified resellers that it has discontinued the retail box for its cloud-based syncing product, suggesting the company is prepared to launch a rumored overhaul of the service. The MobileMe single license and family pack are no longer available on Apple's online store. In addition, resellers have indicated to AppleInsider that both the MobileMe Single User product (identified as MC660Z/A) and Family Pack (MC661Z/A) have been declared "End of Life" by Apple. 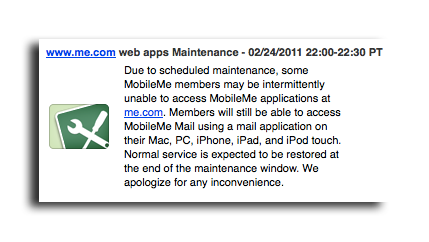 Users of MobileMe were also notified of scheduled maintenance for the me.com website. The service's Web-based applications may not be accessible to some users for about a half-hour tonight, after which normal service is expected to be restored. The changes come as Apple is rumored to be revamping the MobileMe service, and is also said to be considering making the product free. The New York Times reported this month that Apple plans to turn MobileMe into a free service that would serve as a digital "locker" where users could store photos, music and videos. Apple has been rumored to be pursuing a cloud-based iTunes service, particularly for music streaming, for years. The Times said that such a move would negate the need for a large amount of local storage on mobile devices like the iPhone. And on Wednesday, Apple executives revealed at the company's annual shareholder meeting that its massive $1 billion data center in North Carolina is set to open this spring. The usually tight-lipped company also let slip that the data center will be used to support iTunes and MobileMe.